The court also observed that the condition of the city roads was the same since the year the petition was filed (2015). BENGALURU: The Karnataka High Court on Wednesday set a stiff challenge for the BBMP: Fix all potholes by Thursday. “This court expects that there should not be a single pothole in Bengaluru by tomorrow. The city cannot be allowed to be at anybody’s mercy and it needs to given its glory from every angle. Work will have to be done in right earnest. Let us see if you are able to do it tonight,” the court said before adjourning the hearing to Thursday. A division bench of Chief Justice Dinesh Maheshwari and Justice S G Pandit made this observation while issuing an oral directive to fill all potholes during the hearing of a public interest litigation filed by Vijayan Menon and three other residents of Koramangala in 2015, pointing to the pathetic conditions of the roads in and around the city and particularly, the menace of potholes and ditches. The court’s directive comes a few days after it ensured that the BBMP and the city police implemented the law to remove all unauthorised hoardings, flexes and banners in the city. The court warned of directing the state government to take over BBMP when it was told that the civic body prepares its measurement books pertaining to potholefilling works only after the works are completed. The court had asked BBMP to present the books during Wednesday’s hearing itself, but the civic body explained why it was not able to do so. BBMP engineers, on their part, merely said the challenge will be impossible to meet and cited several technical and logistical hurdles to achieving such a feat. When the BBMP counsel mentioned the census of potholes in the city, the court said: “Your officers are not ashamed of conducting census of potholes instead of filling them? Are they expecting the court to dance to their tunes? Your engineers and contractors are responsible for the pathetic state of the roads. 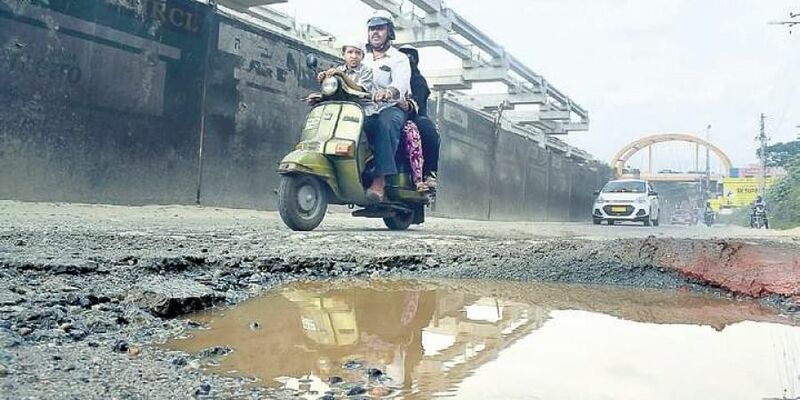 It is not only the issue of potholes bothering us…anybody who comes to Bengaluru from outside asks ‘Bengaluru traffic ka kya kare?’ (what do we do about Bengaluru’s traffic? ),” the court said. The court also observed that the condition of the city roads was the same since the year the petition was filed (2015). “Potholes are minor issues which can be sorted out. What about proper management and widening of roads? Even the speedbreakers are a nuisance in the city, and are posing a threat to the motorists,” the court said. BBMP Commissioner N Manjunatha Prasad told The New Indian Express that for the past days, they have been filling potholes — some manually, and some with the help of Python, the automated pothole-filling vehicle. “If there are potholes on the road which come under defect liability period (within three years), the contractor concerned has to fill them. Else, we outsource it to a contractor who fills potholes. We find it difficult only when it rains, otherwise our people are doing it on a routine basis,’’he said.